These verses give us a bleak scenario on the human condition. Paul makes it pretty clear, we have ALL sinned. We ALL fall short of the glory of God and NONE of us is righteous, NOT EVEN ONE! There is not one person on this earth that is living without some sin in his/her life. In some way, shape or form we ALL sin against God. Not one of us is perfect and not one of us will ever be able to say that we are sin free. We learned in the verses above that we all have sin in our lives. The consequences of that sin is death. BUT God gives us the GIFT of eternal life through His Son Jesus Christ our Lord. God sent His only son, Jesus Christ, to pay the price for our sins. Christ died for us, so that we may live eternally. God loved us that much! We CAN have eternal life in Heaven after this life is over. We have to believe that God raised Jesus from the dead and it is only through Him that we be saved from our sin and the eternal fires of Hell. We have to declare with our mouth that Jesus is Lord. It is when we profess our faith and share our faith with others that God works in our hearts and transforms our lives. 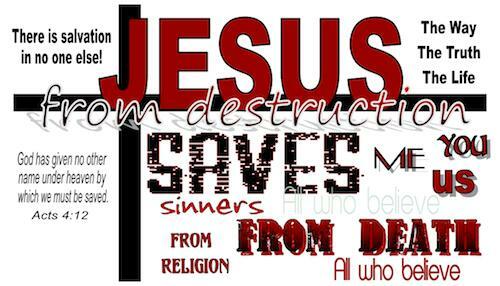 God promised that when we profess Jesus as our Savior and call on the name of the Lord we WILL be saved! How reassuring to know that even though life may one struggle after another, but if we call on God, we WILL be saved and spend eternal life in Heaven. We are no longer condemned in our sin. If you are someone who has been wondering what a life in Christ is all about or you are ready to take the next step, the Romans Road is a great place to start and you are always invited to contact me and we can go through it together. I am always here to share how God has worked in my heart and my life and to walk with you as you discover Jesus in your own life. God Bless!